MANILA, Philippines - The Department of Education (DepEd) officially released on Friday, May 5, the official school calendar for school year (SY) 2017-2018. Based on DepEd Order No. 25, series of 2017, the opening of classes shall be on Monday, June 5, 2016 and the last day shall be on Friday, April 6, 2018. The school year is consist of 204 school days inclusive of the five-day In-Service Training and the four days for the Parent-Teacher Conferences (PTC) conducted every quarter. However, learners are expected to be in school for a total of 195 class days. Deworming of children in school shall be conducted within the months of July 2017 and January 2018. The career guidance program should be administered between July and November 2017 to guide Grades 9, 10 and 11 students in making informed choices on their preferred Senior High School (SHS) track. DepEd added that Christmas break shall begin on Friday, December 22, 2017. Classes shall resume on Wednesday, January 3, 2018. The summer or remedial classes shall begin on Monday, April 16, 2018 and end on Friday, May 25, 2018. 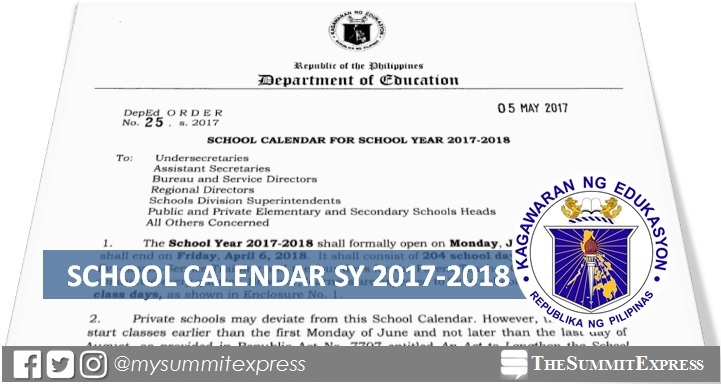 DepEd said private schools may deviate from this School Calendar. However, they may not start classes earlier than the first Monday of June and not later than the last day of August, as provided in Republic Act No. 7797 entitled An Act to Lengthen the School Calendar from Two Hundred (200) Days to Not More Than Two Hundred Twenty (220) Class Days. Private schools should notify in advance their respective regional offices (ROs) regarding any deviation from the school calendar.